"This recipe is easy and tasty. 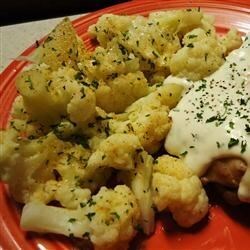 Even those who tell me they don't like veggies or cauliflower eat this one and love it." Place the cauliflower into a large pot and cover with water. Bring to a boil over high heat, then reduce heat to medium-low, cover, and simmer until fork-tender, 5 to 7 minutes. Drain and allow to steam dry for a minute or two; chop into bite-size pieces. Melt 1 tablespoon butter in a skillet over medium-high heat. Cook the onion in the butter until the onion is browned, about 5 minutes. Add 3 tablespoons of butter and cook until the butter is melted. Stir in the bread crumbs and cook until the mixture bubbles. Mix the cauliflower into the skillet and cook until the cauliflower is warm, 3 to 5 minutes. Season with salt and black pepper; serve hot. Had this recipe last night and my kids loved it. I must note that I did add about 3 tablespoons of additional butter so it wasn't so dry (from the breadcrumbs).